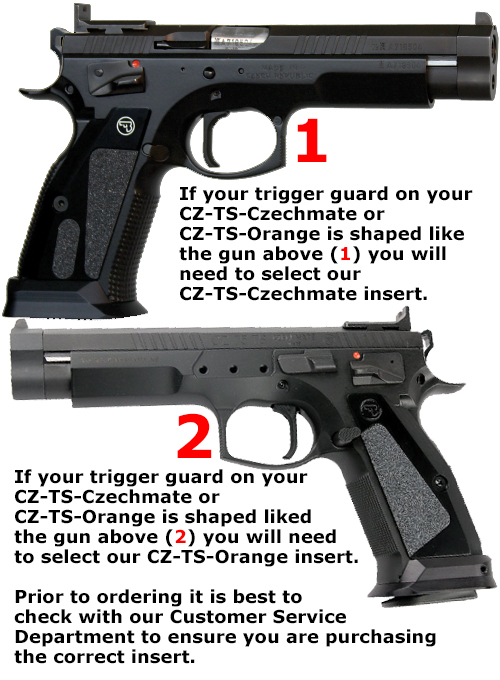 PLEASE NOTE: If you are ordering a holster or an insert block for a CZ TS checkmate or CZ TS Orange, please contact us first with a picture of your trigger guard area. CZ seem to be using two styles of frames for these pistols ,and without seeing your gun, we will not know which insert model you need. More details here: Click here for more details. The Alpha X Holster utilizes an efficient and easy system to allow shooters to switch their holster from one gun type to another by simply changing the Insert Block Assembly. This switch is fast and easy and can be done in less than a minute, and without losing any of the holster's adjustments or settings. The Holster Insert Blocks are designed to be used in either RH or LH holsters. The same insert works for both Alpha-X as well as the older Race Master holster. 1. The Locking Block (gun specific). 2. The Sliding Lock, assembled (gun specific). 3. The safety lever, assembled. 4. The internal magnetic activation system, assembled. 5. “Magnetic logo” to cover over side hole in holsters which may still have it. 1. Remove the insert block from the holster by removing the two small M4 screws from the back of the holster. 2. Using a punch and hammer, push the two steel pins from the front of the block towards the back (push from the side with the gun type engraved). These pins may be tight. 3. Once the pins are out, the plastic wedge holding the 2nd magnet will come out. Make sure the magnet does not fall out the part. It is usually held snugly it its pocket. 4. Use a marker to make a dot on the top of the magnet which is embedded in the slide lock. This will make it easy for you to ensure that you reassemble it with the correct side up. Most likely it will fall out or you will want to remove it while fitting the slide lock. 5. To remove the slide lock from the block, unscrew the M3 screw visible from the back of the block – and then slide the slide lock upwards and out through the window in the block – passed the safety lever, which must be in the unlocked position.